Part of the show Can you dehydrate in a bath? Try emptying one bottle by turning it upside down, whilst at the same time emptying another by swirling the water around inside as you turn it over. You should find that the bottle which has been swirled empties faster. When you empty a bottle the water leaves, but air has to take its place, so in the narrow neck of the bottle the air has to pass around the water. If you just turn the bottle upside down this happens in a series of 'glugs' as some water falls out, then a bubble of air passes up the neck of the bottle then another lump of water falls out. This means that the water has to speed up then slow down every 'glug' which is a very slow process. The spinning water leaves a path for the air to enter. 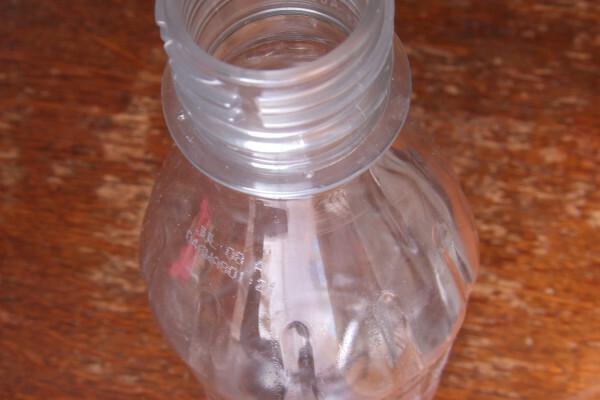 If you spin the liquid it is thrown out to the sides of the bottle, leaving a gap up the middle which the air can travel. So although the path of the water is much longer it will still empty faster. Of course an even faster way of emptying the bottle would be to drill a hole in the base of the bottle so the air could get in directly, though that would be cheating. Next How does melting ice affect the volume of a drink? Which way would a dirty golf ball turn? If you consider the time needed to drill the hole, it's not really a very fast method, even if it is cheating! The fastest (cheating) method is to hold the bottle upright, and hit (downward) on the mouth.